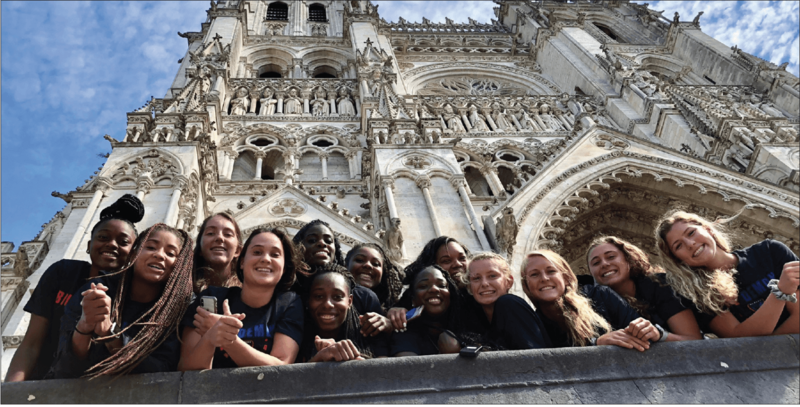 After many hours in the classroom, the DePaul women’s basketball team set off for an 11-day this past summer trip through France and Italy to learn about the life and works of St. Vincent de Paul and Louise de Marillac. The trip was led by DePaul’s Secretary and Vice President for Mission and Ministry Father Ed Udovic and Assistant Director of Athletics Academic Advising Terri Sullivan, who assisted with the classroom portion of the course. The trip had three priorities the team set out to achieve, the first of which was first education that not only focused on the Vincentian mission, but also included a trip to Normandy, the site of the D-Day invasion, and a trip to the Vatican in the latter part of the trip. Bruno added that for his players to have the opportunity to walk the beaches, sit in the pillboxes and understand the soldiers sacrifice was a major part of the education aspect. Sophomore guard Jolene Daninger called the experience “breath-taking” as the players, coaches and family on the trip toured Pointe du Hoc and Omaha Beach. The players also spent time studying the history of Rome, the Roman Empire, and the Vatican. While student-athletes don’t always have the opportunity to study abroad, Bruno credited DePaul athletic director Jean Lenti Ponsetto with developing the idea to not only send players abroad, but also incorporate the Vincentian element. Bruno also thanked donors and other contributors for helping student-athletes to have the opportunity to take the week-and-a-half-trip, while regular students may be able to take a semester or full year to study abroad. With five new freshman, the trip also served as an opportunity for the players to bond. On the final day of the trip, senior forward Mart’e Grays reflected in a diary entry, filed by each player at the end each day, that the trip served as a tremendous opportunity for the team to come together. Amidst all the travel, the team also played and won three games against opponents Bruno said were comparable to a Division 1 opponent. Bruno said the trip was especially beneficial for the five freshmen who had the opportunity to use a little bit of trial-and-error to see what would work at this higher level. Bruno was also thrilled to see Daninger and Dahlman back on the court, as well as, junior Dee Bekelja who started all three games. Although she did not miss last season due to injuries, Bruno was proud of the way Dee Bekelja performed starting all three games and scoring 29 points on the trip. After a week and half off back at home, the Blue Demons returned to work as they get get ready to open their season Nov. 9 against UW-Green Bay.